Svein's recent review of Simon Sebag Montefiore's Stalin biography finally made me write up some book reviews I've been planning for a long time. Originally I planned a posting with a "Russian bibliography", consisting of the books on Russia I read the last couple of years, both to prepare for the holiday, and because I'm interested. I had to stop after four books, however, since it became clear that this would be much too long for one posting. So here are the two Stalin biographies, at least. Whether any more will appear remains to be seen. Robert Conquest is described on the cover as the authority on Stalin, and while he may well be, I wouldn't really describe the biography itself as an unqualified triumph. It feels very solid and authoritative, in the sense that you feel that if Conquest states something as fact, then it probably is. 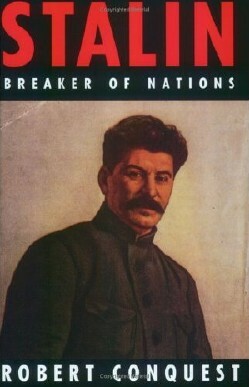 The downside is that while presents a perfectly readable and comprehensive overview of Stalin's life it's not terribly engaging, and you never really feel you get much of an understanding of Stalin, the person. Conquest himself states quite clearly in the foreword that Stalin remains an enigma for him personally (and, he implies, everyone else). In summary, I'm glad I've read it, but I don't consider it to be among the better reading experiences of 2006. As a companion book to the next biography, however, it worked quite well. Edward Radzinsky is in a sense the exact opposite of Robert Conquest, in that his biography is fantastically vivid, but definitely less than entirely faithful to facts. There are a number of wild claims, dubious sources, speculative theories, and obviously factually wrong anecdotes in there. I trust Radzinsky on the outlines of Stalin's life story, and some of the detail, but definitely not all the detail, and for all the vividness of the book, Stalin himself doesn't really come to life in any convincing way. What does spring out with almost startling clarity, however, is a picture of Soviet society under Stalin. That is, Radzinsky gives a very good idea of what it must have been like to actually be a citizen of Stalin's Soviet Union. This applies to the lives of ordinary citizens, but best to the members of the "elite". 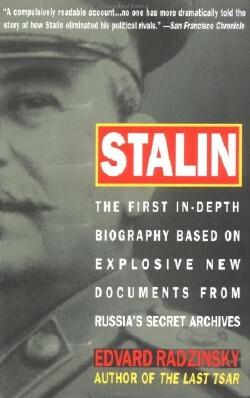 In summary, if you are looking for a single Stalin biography to read I hesitate to recommend this one, given how inaccurate it is. However, I strongly recommend it for bringing the past to life, and for being an almost compulsive read. Reading it together with Conquest's book works quite well. The only evil that could be compared with his own was that of another little man with a moustache [Hitler, obviously], whom he never met, and who was not as successful. That seems to me the biggest difference between the two: Stalin was more successful. What I mean is that Hitler died as an utter failure, whereas Stalin died of a stroke. To put it another way: Hitler lost WWII, and he lost it to Stalin. Btw lose not loose rho. I have a feeling that someone who doesn't know the difference between the two shouldn't be running the world. The people who are doing it now are perfectly good. who is the "elite" under stalin? The elite were the high-ranking party officials, people high up in the various branches of the party and the military. The Stalin period was hard for everyone in the Soviet Union, but the elite was hit much harder than anyone else. Of the party leadership from Lenin's time hardly anyone survived except Stalin's cronies. The army is a similar story. And so on. Both men must compete with Mao and perhaps neither can match the body count of the Chairman.